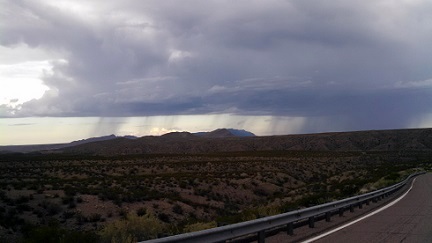 You can see things out west that you can't see back east. Growing up in an eastern city in the 40s and 50s, I imagined a lot about the west. Sometimes my imagination was helped by music. Ferde Grofé (27 March 1892 – 3 April 1972) was a 20th century American composer, arranger, and pianist whose primary works were musical pictures of places in the US. Grofé is best known for his composition The Grand Canyon Suite (1931), a work regarded highly enough to be recorded for RCA Victor with the NBC Symphony conducted by Arturo Toscanini in Carnegie Hall in 1945. The movements of the suite are: I. Sunrise; II. Painted Desert; III. 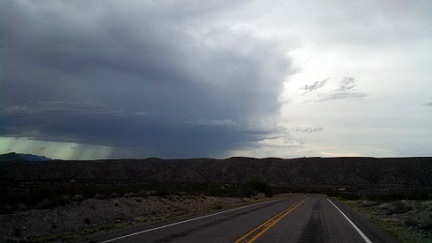 On the Trail; IV. Sunset; V. Cloudburst. 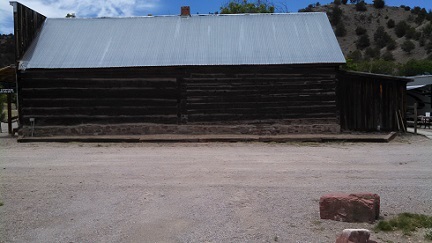 The best known movement was 'On The Trail' portraying the donkey ride down to the bottom of the canyon. Everyone knows that tune, even if they don't know where it came from. 'Cloudburst' vividly pictures the fury of nature in a summer thunderstorm over the Grand Canyon. Years ago, the music helped me imagine the scene. Today the scene brought back the music. Life is good. 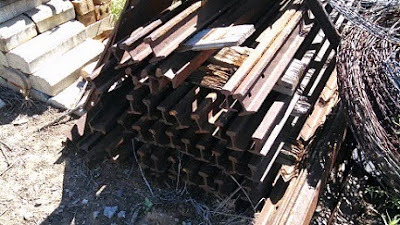 We're Going to Build A Railroad ?? 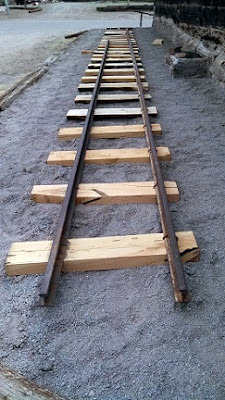 In one of our email exchanges Don told me he wanted me to help him build a railroad during our time at Chloride. Sure! Why not? 'Gandy Dancer' is not yet on my resumé. 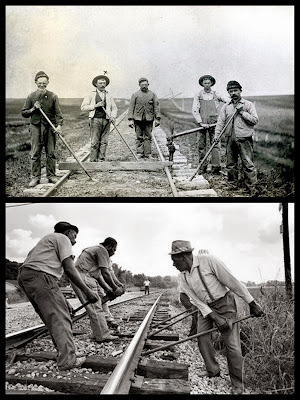 Gandy dancer is a slang term used for early railroad workers who laid and maintained railroad tracks in the years before the work was done by machines. In some texts, the term is described as specific to those workers who built the track. 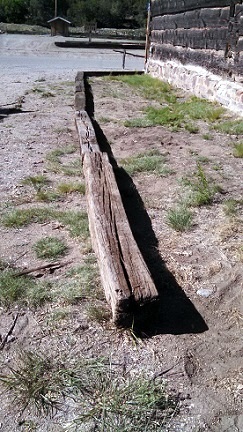 One text states that "layers of railroad track are hardly ever called gandy dancers." 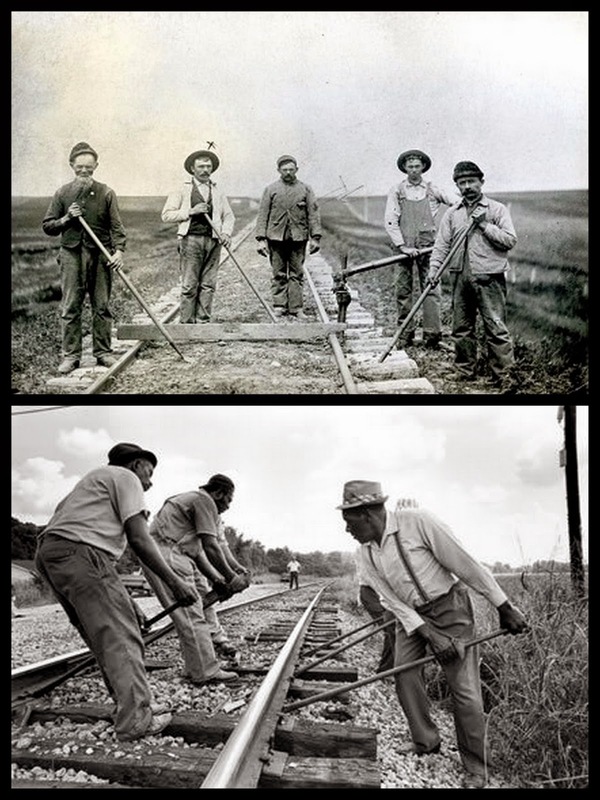 However, most sources refer to gandy dancers as the men who did the difficult physical work of track maintenance under the direction of an overseer. 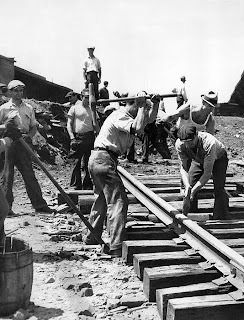 There are various theories about the derivation of the term, but most refer to the "dancing" movements of the workers using a specially manufactured 5-foot (1.52 m) "lining" bar (which may have come to be called a "gandy") as a lever to keep the tracks in alignment. When I was a kid, there was a popular song titled The Gandy Dancers' Ball sung by Frankie Laine. The Gandy Dancers' Ball was recorded by Frankie Laine in 1951, but with gandy dancers as actual dancers at a railroad workers' ball. Laine sang it with a chorus of dancers in the 1955 comedy film Bring Your Smile Along. "So gandy dancing goes in with the music. That's the way it’s been since way back. 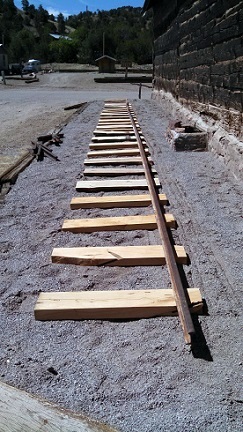 In the beginning of the railroad, you had to line it up. That’s where the gandy dancers come in. And you even gandy danced behind a maul. Even spiking, you make the spike maul talk; you sing to it. Like when you’re driving a spike down. [SINGING] “Big cat, little cat, teeny kitten. Big cat!” That’s you driving the spike as hard as you could. 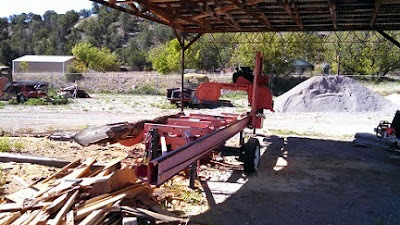 He’d holler, “Make a wheel out of that maul.” And that means spike fast. And so, with two of us spiking, you make that maul talk! “Big cat, little cat, teeniny kitten,” and that spike would be down." 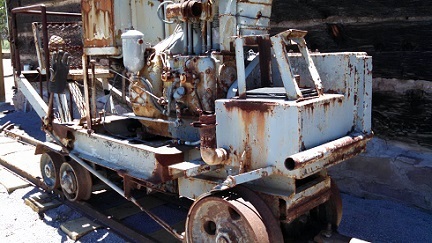 Chloride is all about silver mining. 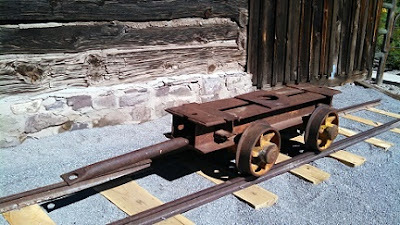 So Don is talking about the small narrow gauge railroads used to transport ore out of the mines. I guess Gandy Dancers didn't work on those railroads. I'll scale back my expectations, but it will still be a fun project. I thought about doing a blog post about this when the project is complete. I changed my mind and decided it would be more fun to let it be a continuing post as the adventure unfolds. I'll update and share as we go along. 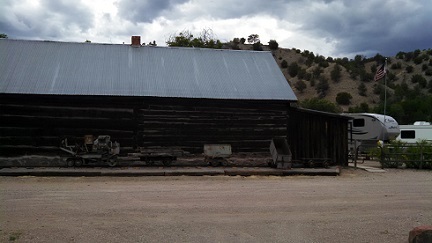 Many of the artifacts displayed here at the Pioneer Store Museum relate to silver mining and the lives of the miners. 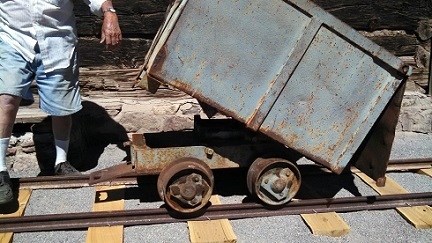 Don wants to add a display of the mine railroad. 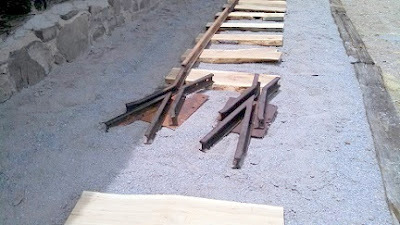 His plan is to relocate the items presently along the side of the museum building and put the railroad display there. Today we got serious. We used the big tractor to pull out logs that will make good railroad ties. 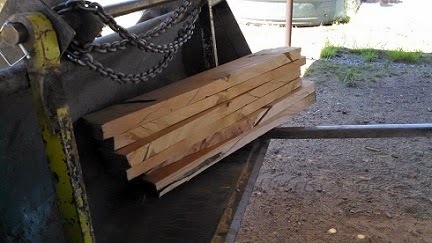 Our ties will be roughly 30" long by 6" wide by 2" thick. I say roughly because we don't want precision here. We want the variability that characterized the real thing. 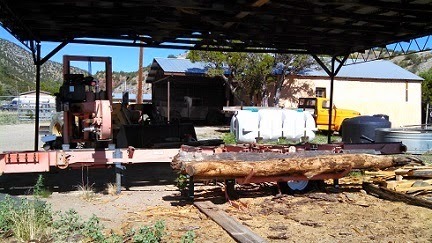 I learned that Don has professional logging experience in his background. 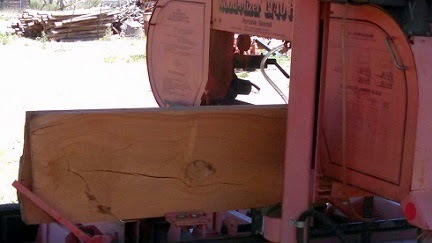 Watching him operate the sawmill made that obvious. 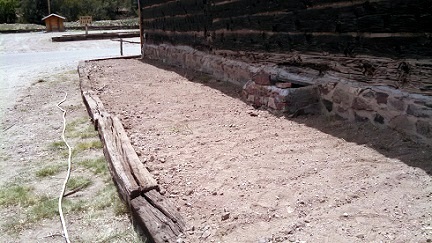 Today we moved the artifacts out of the space we will use for the railroad display. 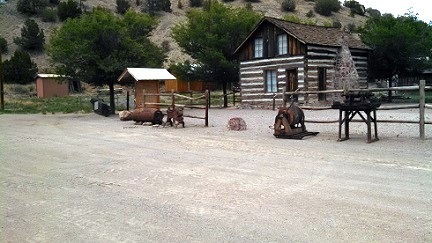 We put them across the street along the fence in front of the Grafton Cabin. Every one of those beauties was heavy. There was no hand carrying. 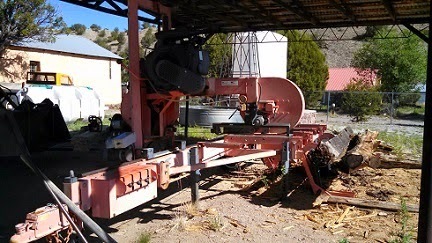 It was the big tractor and chains functioning as a crane. We earned our pay today. Oh, I forgot we don't get paid. 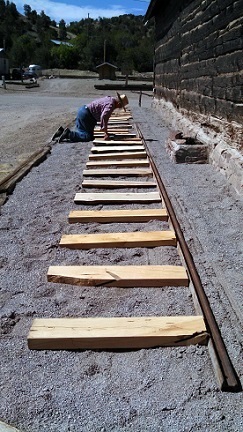 Our next step was to frame and fill our railroad display space with dirt for the bedding. We accomplished that today. 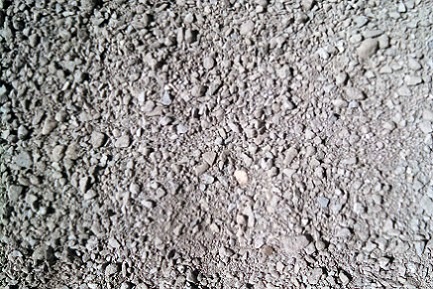 The last step in preparing the road bed was to add a layer of "Crusher – Fine" fill material. We got that done today. After three days off, we got back to it today. 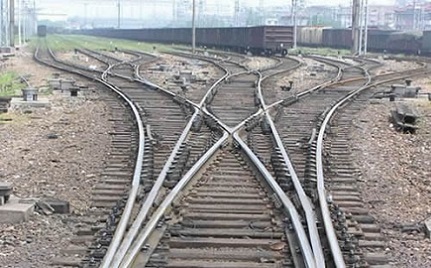 Let's make this thing look like a railroad. 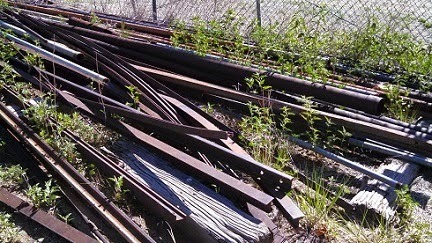 We brought a second thirty-foot long rail and several short sections to the site along with all of the ties we previously cut. We lined up the long rail with the building wall and laid out the ties for spacing (27" apart). Good news, we have enough ties; we don't have to cut any more. We rolled the rail onto the ties to hold them in position; then added two more short sections of track to fill out the space. 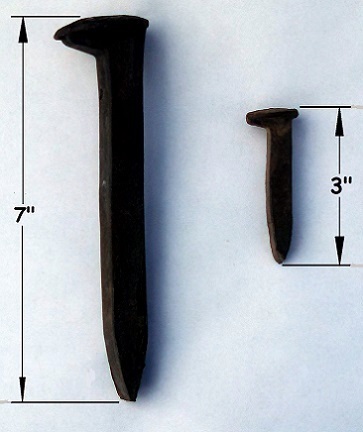 We have some railroad spikes displayed in the Pioneer Store Museum. They are in two sizes. 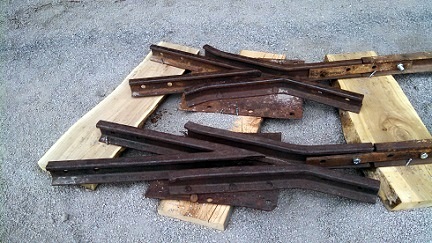 The larger ones (7" long) were probably for the full sized railroads. 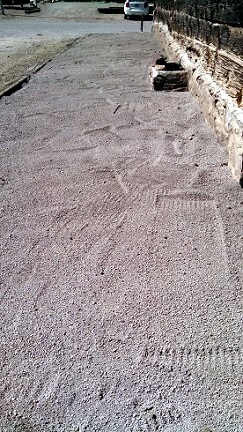 I'm guessing the small ones (3" long) may have been for mine tracks. 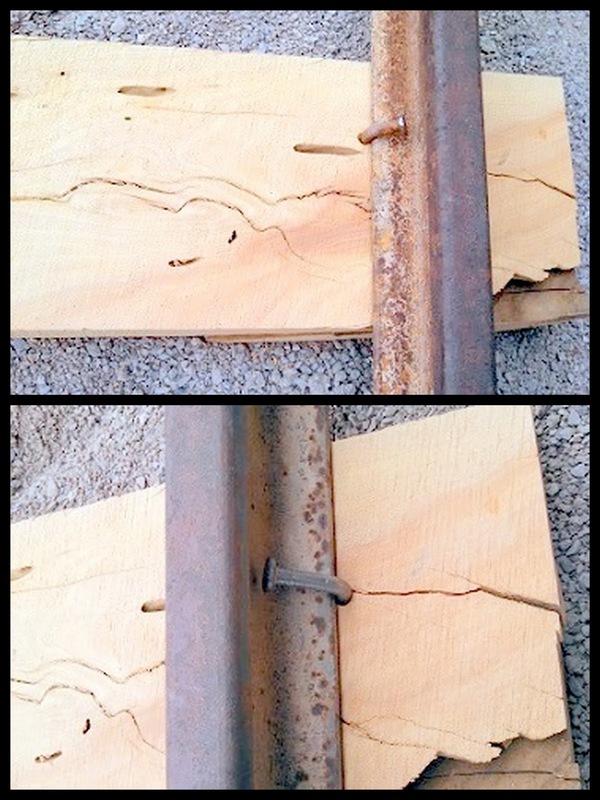 Alas, we have no railroad spikes of either size; 10 penny nails will have to do for now. We'll work with what we have. If Don discovers a better answer, that will be a project for another workamper sometime in the future. Don wants to work these two switch frogs into the display somehow. So we laid them into a possible position for consideration. We'll think on that for a bit. 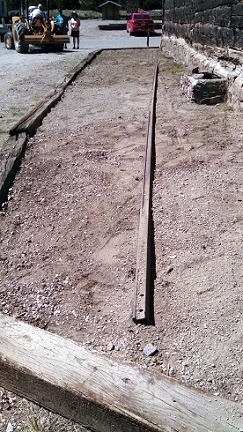 Today was spent nailing rails to ties. 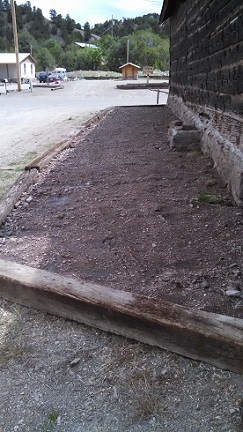 We finished the back rail and started on the front rail. 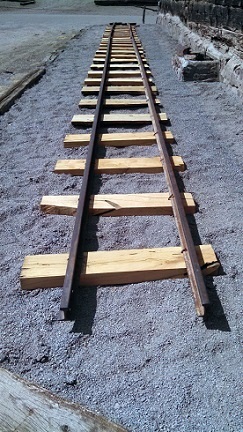 We used an 18" piece of wood as a spacer and a pipe clamp to hold the rails together to get proper spacing between the rails. 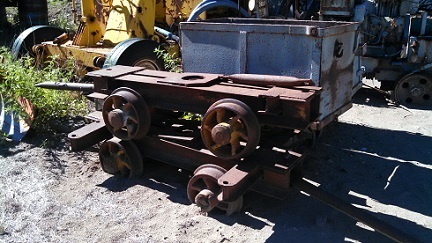 18" between the inside edge of the rails will let the car wheels sit on the track properly. We don't have enough 10 penny nails. 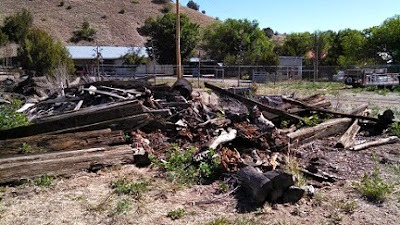 We went to Truth or Consequences to find more. The closest we could come was Gutter Spikes at $1.39 each. We need 100. No way that's going to happen. We tried unsuccessfully to get a box price for 100. We returned home empty-handed while trying to think of an acceptable alternative, and finally settling on these construction nails. So here is our accomplishment for today. Today we drove the "Golden Spike". It wasn't gold of course, it was just a regular nail. But it was the last one. 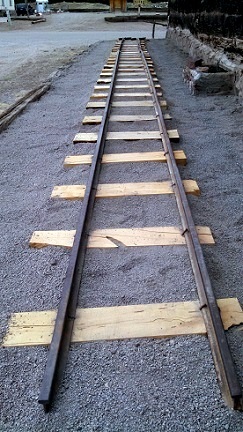 Both rails are in place and fastened to every tie. We also decided to place the switch frogs at the front end of the display area so that they stand out a little more. 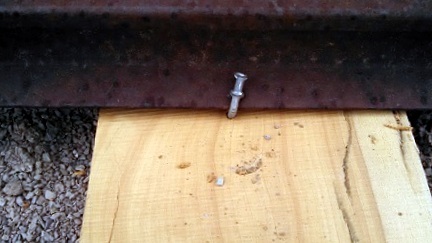 So we positioned them and fastened them down. Finally, we brought in our last load of Crusher–Fine fill material to fill in between the ties. We are ready to place the cars on the track. Today was the big day. 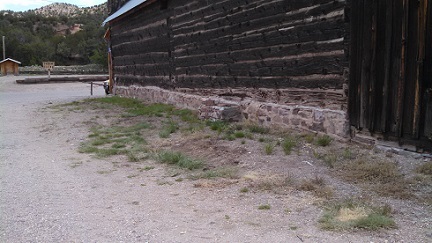 We moved the cars from the storage yard to the exhibit. 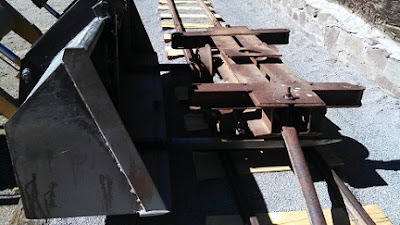 The flat cars were pretty easy. 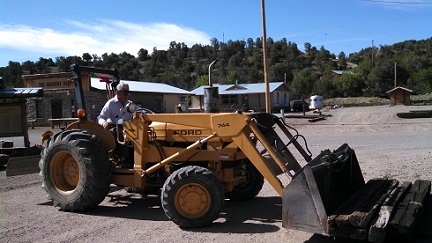 They are long enough to fit on the forks of the tractor and Don is good enough with the tractor to accurately set them down on the rails. 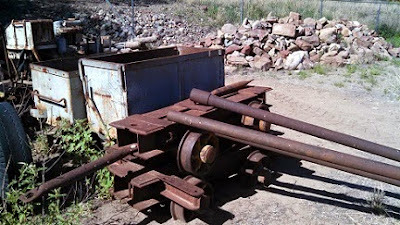 The ore cars were a little tougher. They are too short to fit on the forks. 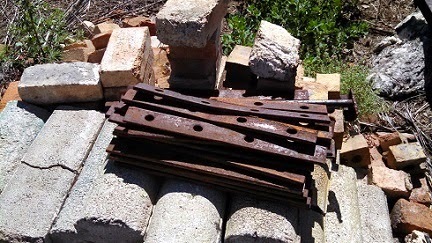 The answer was to support them with a couple pieces of pipe, stretcher style, under the bucket, long enough to span the forks. 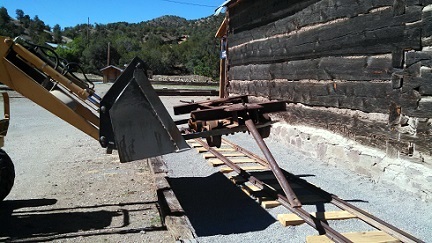 That worked well, so we quickly transferred the two ore cars to the display site. 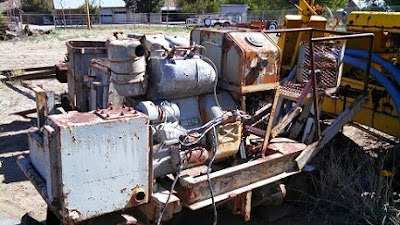 The Donkey (engine) was another story. It is heavy with no way to place the forks under it without serious damage and probably dropping it. 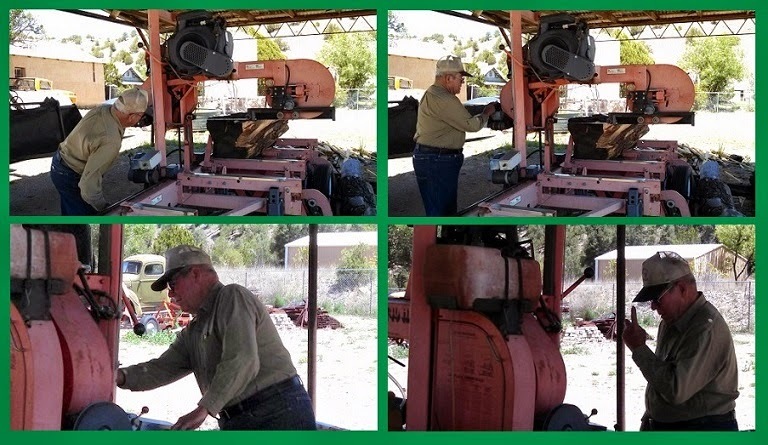 We took the forks off and searched for ways to use chains to hang the Donkey from the bucket – still not knowing if the tractor could lift it. It took several tries before we finally found a scheme to lift the Donkey, keeping it upright and approximately horizontal. Then came the big test. 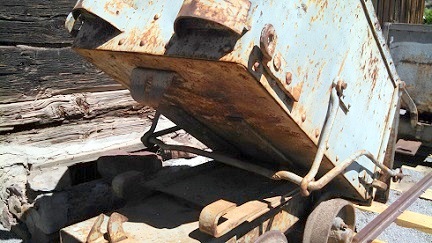 Could we lift it without the back wheels of the tractor coming off the ground? That became a balancing act to position the bucket. We finally got that right. 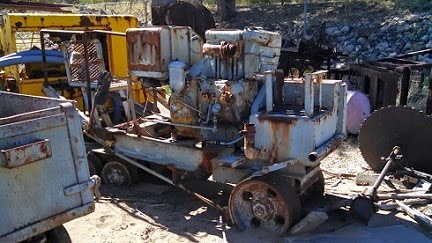 I expected to see a hydraulic line burst at any minute. Didn't happen and we made it, but the trip from the storage yard to the display was veeerrry slooow. Setting the Donkey on the rails was an adventure too. 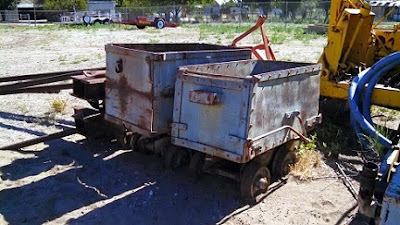 The ore cars have four fixed wheels, but the Donkey has two fixed wheels at one end and a swivel carriage of four wheels at the other end. So we had to position the donkey over the track to align the fixed wheels and then rotate the swivel carriage to align those four wheels. Remember, the whole thing is hanging from chains. Accomplishing that was a real high five moment and we felt great. 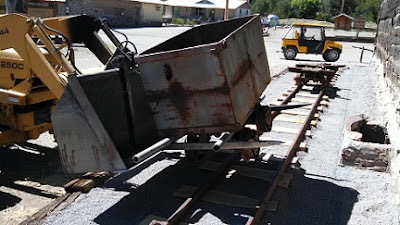 After we got everything set up, we played with the ore cars for a bit. They are made to 'dump'. So we want them to dump. 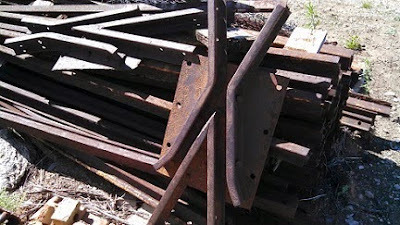 Age and rust made it difficult, but once we had them broken loose, they dumped easily. We're thinking the display should have one of the ore cars dumping. 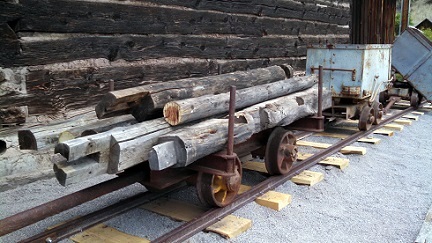 The railroad not only hauled ore out of the mine; it also hauled in construction materials. So Don wants the display to illustrate this by having one of the flat cars loaded with hewn timbers. We cut some pipe to serve as vertical braces on the flat car. 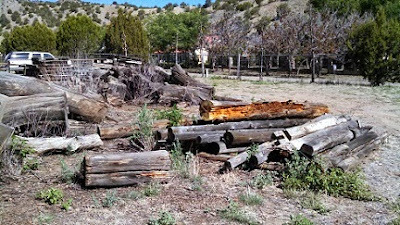 Then off to the log pile to dig out some timbers. 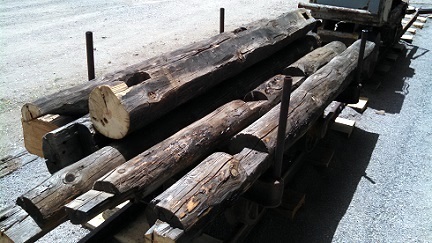 We found some that looked good, trimmed them up a bit, then hauled them to the display, and loaded them onto the flat car. They look great. Here is the finished project. 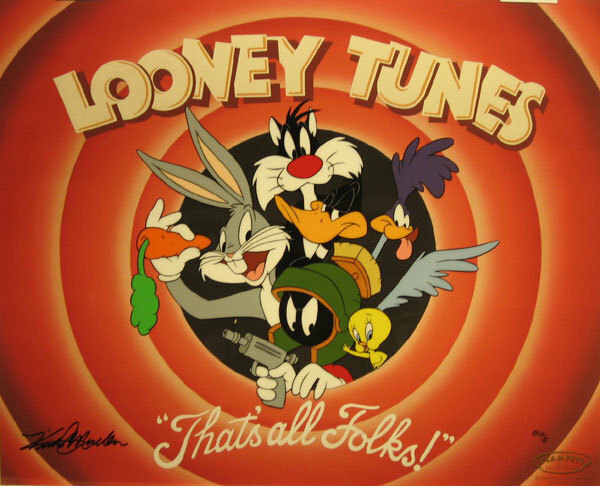 At least, I think we're finished. Time to sit in the shade for a while.